The Federal Reserve Board’s Federal Open Market Committee (FOMC) kept the federal funds rate at a target range of 0.25-0.5% at its March meeting, and cut its projection for rate increases in 2016 from four to two. In her comments following the FOMC’s meeting as well as during a speech later in the month, Fed Chairwoman Janet Yellen said that caution is appropriate in regard to raising rates given weak global growth and the fact that the Fed currently lacks tools to respond to possible new threats to the economy. Regarding concerns about rising inflation, Yellen added it is not yet clear that the rise of core inflation during the past few months will prove durable. Markets took Yellen’s comments to mean that the FOMC’s June meeting would be the next chance for a rate hike to occur. However, her remarks contrast with those of some other Fed governors who have suggested there are sufficiently strong economic data to consider a rate hike as early as the FOMC’s April meeting. The third estimate of real gross domestic product for the fourth quarter showed the economy expanded at a 1.4% annualized rate, up from the second estimate of 1.0% growth and the initial estimate of 0.7% growth. An upgraded estimate of consumer spending was responsible for the majority of the change—it advanced at a 2.4% rate in the quarter, up from the prior reading of 2%. Spending on services was the primary driver of the category’s increase. For the year, consumer spending grew 3.1%, the most since 2005. 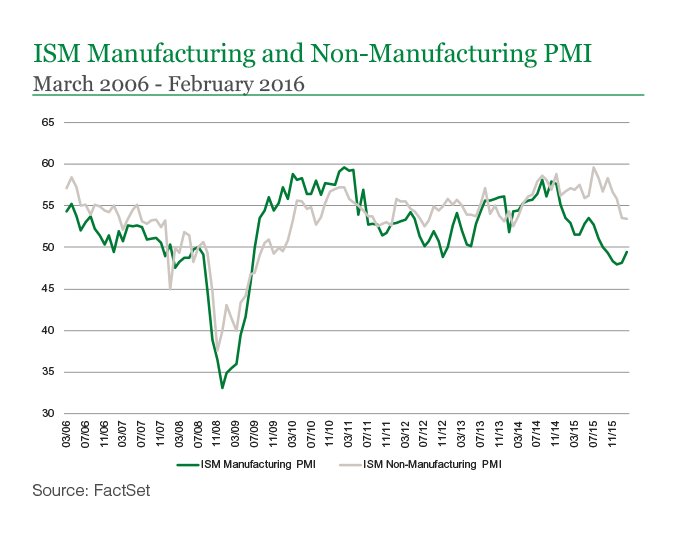 The Institute for Supply Management’s manufacturing purchasing managers’ index (PMI), which has been weaker in recent months, reversed course and ticked up during February. The manufacturing sector continues to be hurt by a strong dollar and weak global demand. We have been monitoring the slowdown in manufacturing activity and considering its potential effects on overall economic growth. Many have pointed to the decline in the manufacturing PMI as a harbinger of future economic problems. Granted, despite the improved number in February, the manufacturing PMI remains slightly below 50 (meaning it is still in contraction territory), but we believe an overly-pessimistic analysis goes too far. The non-manufacturing PMI remains in expansion territory, which mitigates the effect of the weaker manufacturing PMI. In 1998, and to a lesser extent in 2005 and 2012, the manufacturing PMI fell while the non-manufacturing PMI stayed in expansion mode, and the manufacturing PMI eventually picked up. A continued weakening of the dollar, a grandfathering-in of dollar weakness, or a pickup in global growth could relieve some of the pressure on manufacturing. Overall, our economic indicators do not suggest that a U.S. recession is imminent. The terrorist attacks in Belgium heightened the focus on what was already a tense situation for Europe—getting a handle on migration into the European Union (EU). The EU has reached a deal with Turkey to stem the flow of immigrants, most of whom arrive in the EU via Greece. In return for better controlling the flow of migrants to Europe, Turkey would receive visa-free travel for its citizens and also monetary compensation. Despite the deal, we continue to believe that immigration will remain the primary risk in Europe. It is causing divisions between and within EU countries on refugee policy as well as supporting the rise of far-right parties such as the National Front in France and the Alternative for Germany (AfD). It is also stressing governments’ fiscal positions. These tensions will be acerbated by the recent attacks in Belgium. In terms of terrorism’s effect on markets, we believe one potential negative is its impact on the free movement of people within Europe, which we view as an imperative for the region. Acts of terrorism that ultimately result in restrictions on the movement of individuals will increase transactions costs and act as a headwind to further political and economic integration. Neither the deal reached with Turkey nor the recent terrorist attack changes our view on Europe. We continue to believe that slow-growth is the most likely path forward. However, we will remain cognizant of the risks caused by tensions stemming from the migrant crisis. There was a barrage of events in March that pointed to an increased likelihood that Brazilian President Dilma Rousseff will be impeached. 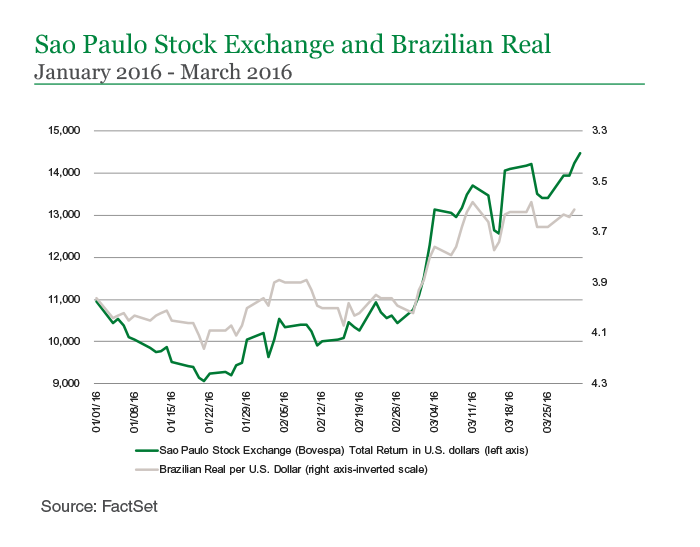 This led to a sharp rise during the month in both the Brazilian equity market and the country’s currency, the real. Right now there is no clear answer to the question of who might succeed Rousseff. Brazilians don’t have much to show for Rousseff’s tenure, leading us to believe that the next administration would not continue the leftist, populist bent of Rousseff and the Workers’ Party. That is a positive. Brazil has severe fiscal and structural problems that are unlikely to be solved overnight. The Brazilian budget deficit is more than 10% of GDP, and the continued contraction of the economy has increased unemployment, tightened credit conditions, and hurt tax revenues. The government cannot easily cut its spending programs due to constitutional mandates, and real incomes are declining given high inflation. Burdensome regulations negatively impact Brazil’s competitiveness and business profitability and severely depress the country’s potential growth and investment climate. While a change of government would likely be met with fanfare in the near-term, Brazil’s next president will be in the unenviable position of inheriting an abundance of challenges that will require building political consensus and real sacrifice to solve. For now, we maintain our investments in Brazil since our core portfolio holdings in the country are levered to secular—rather than cyclical—growth themes, but we are following the political situation closely. Global equity markets generated strong positive absolute returns during March and by the end of the month had nearly reached the levels at which they opened 2016 on a local-currency basis. Returns are modestly positive for the year on a U.S.-dollar basis. Valuations in the broad U.S. stock market remain somewhat elevated, but we continue to see little evidence of excesses in the market or economy that would need to be unwound. In this environment, discernment and flexibility are critical. Given the slow global growth environment, in portfolios geared toward investors that need capital growth, we are targeting investments in fundamentally strong businesses that are not heavily reliant upon macroeconomic growth to drive sales and earnings. More specifically, we see value in businesses that we believe have control of their destiny and are taking share in large established markets or are creating new markets on their own. The goal is to identify companies trading at attractive valuations relative to their growth potential. For fixed income investors and investors with a shorter time horizon or current income needs, we continue to focus on opportunities we are seeing in corporate bonds, investment-grade securities in particular. The corporate sector remains relatively cheap from a valuation perspective. Regarding government debt, a sizable portion of our portfolios’ allocation to U.S. Treasuries is to Treasury Inflation-Protected Securities (TIPS), as we think the market has not been adequately compensating investors for inflation potential in nominal Treasuries. We continue to believe that interest rates do not adequately compensate investors to take on additional duration risk, and therefore our portfolios maintain a modest duration relative to the benchmark. We would look to increase duration through the purchase of longer-maturity U.S. Treasuries or Agencies if interest rates were to increase to more attractive levels. In our view, short-term and income-oriented investors should also explore equities that display stable fundamentals and are trading at attractive valuations. We believe companies that generate strong, stable cash flows and pay an attractive dividend could be compelling options for these types of investors in the current environment.